The pioneering PostureFit® mechanism supports the way your pelvis tilts naturally forward, so that your spine stays aligned and you avoid back pain. The Pellicle suspension conforms to your body, reduces pressure points, and provides unparalleled support. The unique breathable Pellicle suspension dissipates the body heat that builds up while you work, so it keeps you cool and comfortable. Nine easy-to-make adjustments let you make the Aeron chair work just right for the way you work. The Aeron chair moves effortlessly with your whole body, as if your body were telling the chair what to do. The patented Kinemat® tilt mechanism lets your neck, shoulders, hips, knees, and ankles pivot naturally. The high, wide, contoured back takes the pressure off your lower spine. Armrests slope slightly down in the back for the most natural and comfortable support. The “waterfall” front edge of the seat takes the pressure off your thighs, so your blood keeps circulating and you stay alert and focused. 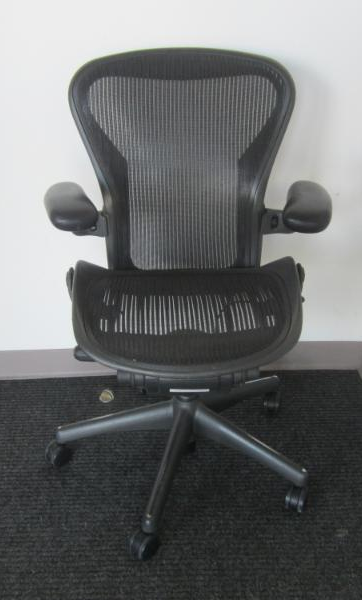 Call ReSource today at 513.554.4944 to order your Aeron chair.